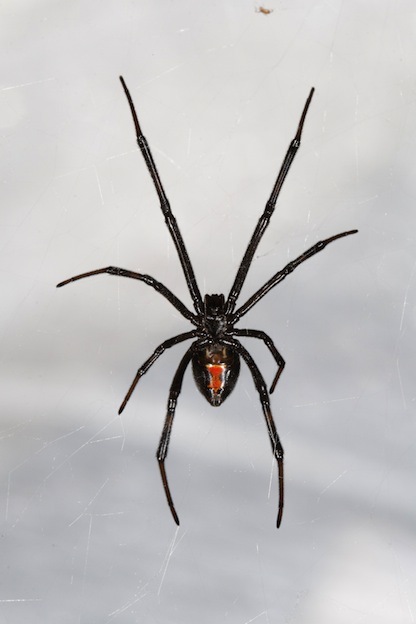 The Black Widow Spider has a reputation for being one of the most dangerous Spiders in the world. This is because they have very large venom glands. When they do bite it is the female most of the time. The males almost never bite humans but it has been known to happen from time to time. Females have a telling sign of the red hour glass or red dots on them. The males have this feature in yellow or white color. They are also about 1/2 the size of the females. They are often mistaken for other types of Spiders. This is because they are usually brown in color rather than black. As a word of caution, any time you see red on the body of a black Spider you need to be aware. It could very well be a dangerous female Back Widow Spider. If you aren’t sure what you are looking at treat it like the Spider is very dangerous. That way you can reduce the risk of being bitten. They are found living in the warmer regions of the United States. Some of them are also found in areas of Canada and Mexico. They tend to enjoy areas that are very warm. During the cold times of year they will hide to find shelter. This is when there is the greatest risk of them being in homes. It is no joke that the strength of the Black Widow Spiders silk is stronger than steel. It is absolutely phenomenal. This continues to be something that experts are puzzled by. This species are nocturnal and very shy. Females can be aggressive if they are disturbed. They make amazing looking webs to capture their prey in. They will hang upside down and wait for prey to come along. They will then inject venom to kill it. This is to help prevent the chances of the prey getting free. They have very poor vision so they rely on vibrations taking place to tell them that they have a visitor. Insects, beetles, roaches, and other spiders make up the majority of their diet. However, they aren’t picky so they will consume just about anything that comes along. She will take great care to keep the web clean after capture and feeding too. If necessary she will make a brand new web in its place. It is possible that the Black Widow Spider will kill the male but she won’t always do so. There isn’t’ really and understanding of why this will occur or it won’t occur. The females give off a scent that determines if they will mate with particular males or not. The males will take part in rituals for mating to help the female be more receptive to her. They offer their sperm and place it onto a location and then the female will place it on her body. This is how the eggs will form that she will place into a sack that is woven from her silk. A bite from a Black Widow Spider is very dangerous. It is going to be very painful due to the volume of venom they produce. Immediate medical attention is important to prevent the venom from spreading. If it isn’t taken care of fast there could be irreversible damages to the tissues of the body. In spite of all of this experts believe that the Black Widow Spider isn’t aggressive. They believe that most bites to humans are the result of them feeling in danger. It is also believed that human fingers can often resemble prey to them.